Agur Schiff was born in Tel Aviv in 1955. He is a graduate of St. Martin's School of Art in London and of the Rijks Art Academy in Amsterdam. He won critical acclaim as a filmmaker before turning to writing: he received the Silver Dragon Award at the Cracow Film Festival, and, for his film Gentila, a prize at the Haifa Film Festival (1997). Schiff started publishing fiction in the early 1990s and has published two collections of stories and five novels. 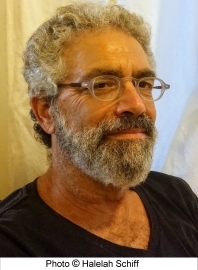 He is a senior lecturer at the Bezalel Academy of Art & Design in Jerusalem where he teaches creative writing, screen writing and cinematic concepts. Schiff was awarded the Prime Minister's Prize (2010), and his last novel, The Latecomers, was shortlisted for the Sapir Prize (2014).